at which hospital you may be more likely to be misdiagnosed. Nobody wants to be ill, or to have to visit their doctor, or to be admitted to hospital, but when we do, we trust them with our lives and health and accept the advice and information provided to us by them. Unfortunately, mistakes do happen and doctors, nurses, dentists and other health professionals can misdiagnose a condition. This could count as medical negligence, and you might be able to make a claim for compensation for it. What types of misdiagnosis are there? Incorrect diagnosis – where you are misdiagnosed with the wrong illness, this could lead to the wrong treatment which could be even more harmful. Or you could even have suffered the anxiety of being told you had a serious illness, when you actually didn’t! What did misdiagnosis claims cost the NHS in 2014/15? The NHS LA uses only two misdiagnosis cause codes when collecting its information. These are ‘failure/delay diagnosis’ and ‘wrong diagnosis’. We asked for the value of claims successfully closed or settled as a periodical payment order (PPO) – that’s a financial order made by the court – in 2014/15 where ‘failure/delay diagnosis’ was either the first or second cause code. Alongside this are the damages that have so far been paid out for these claims. We also asked for the value of claims successfully closed or settled as a PPO in 2014/15 where ‘wrong diagnosis’ was either the first or second cause code. Alongside this are the damages that have so far been paid out for these claims. Successful ‘wrong diagnosis’ claims closed in 2014/15: 150. That means that, together, misdiagnosis – whether it’s failed, late or wrong – has cost NHS hospitals a belting £197.2million in the last financial year! We’ve put this information into an easily shareable infographic, which you can view and download below. Please include attribution to graysons.co.uk with this graphic. What are the top misdiagnosed conditions in the NHS? 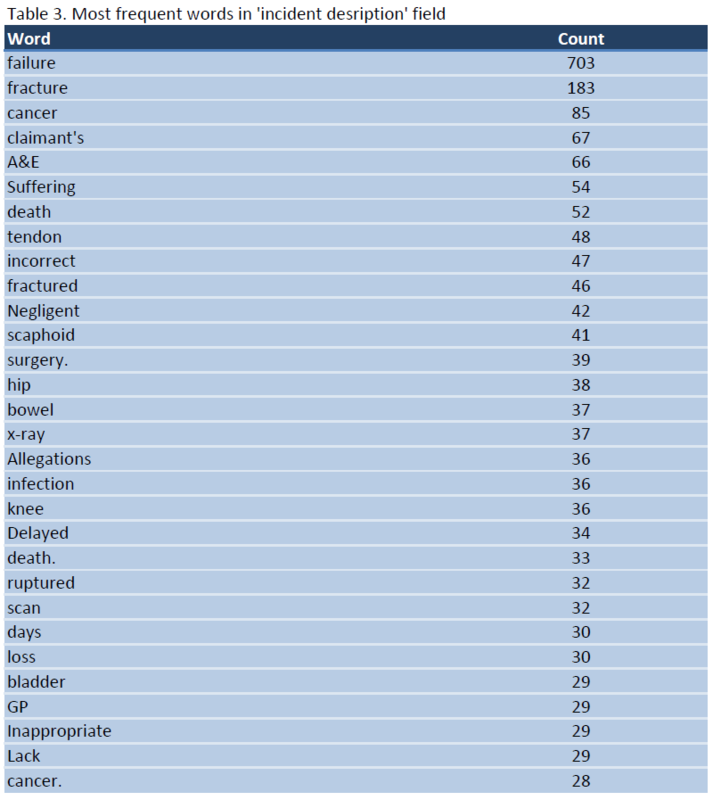 We asked the NHS LA to run a search for the top 30 terms in all the incident descriptions of ‘failure/delay diagnosis’ and ‘wrong diagnosis’ claims that were closed or settled in 2014/15, and this is the information it provided. Why is the word ‘failure’ top? This could relate to failure to diagnose, or it could relate to organ failure. As there’s no context included around this, we can’t be certain whether it’s organ failure or generalised human error that’s the top cause of claims. Any nothing words such as a ‘the’ ‘and’ etc. have been removed or discounted from the information. Obviously the context around these is not included so the NHS LA has strongly recommended that these are not used for research or audit purposes. Which NHS trusts have paid out the most claims for misdiagnoses? We asked the NHS LA for details about the top 5 NHS trusts who had paid out (i.e. settled or closed) the greatest number of claims in 2014/15 for misdiagnosis claims. So, who were the top hospitals for ‘failure/delay diagnosis’ claims? As we can see, the top individual hospital was Nottingham University Hospitals Trust, with 26 claims paid out for a failure or delay in diagnosis. The trust with the second highest number of claims paid out last year was Lewisham and Greenwich. Which hospitals came top for ‘incorrect diagnosis’ claims? Liverpool Women’s Hospital paid out the greatest number of successful claims, with 46. University Hospitals Leicester also comes out with a significant amount – 25 claims – in second place. What are the effects of misdiagnosis? What effects can you claim for? If you’ve been the victim of medical negligence in the form of a misdiagnosis, we’re with you all the way. Here at Graysons we recognise the devastating, and in some cases fatal, effect that a misdiagnosis can have. We understand the importance of compensation to you as it can greatly improve quality of life for you and your family and provide the care and security that is needed. If you would like to talk to a member of our specialist team then please contact us for a confidential and free discussion today. You can read more about claiming compensation for misdiagnosis in our medical negligence pages, as well as information regarding who you can claim against, and a guide to your claim. Contact us now for a free of charge meeting in which we can discuss your case – or give us a call on 0114 272 9184.